N.B. There is no need to Log in to post a comment. Teenager with Altitude – Carshare League:- Indeed a hot one.....Results. Eskdale Elevation:- Dave Sykes helps out with:-"On a beautiful April day six dark peakers undertook a quintessential lakes race. With so much route choice, loads of climbing and plenty of route choice this is my new favourite race - 18km and 1400m of up and down. For me the downside was a lot of running but there were 2 very steep climbs and a never ending descent off Sca Fell to compensate. Max Wainwright won in a new course record and DPFR narrowly missed out on the team prize being pipped by Ambleside ( if only I’d got a better line to Eel tarn). Heartily recommended (unless your Mike Nolan - sooooo rough!)" Kong Mini MM Round 2:- from Chapel Stile. .Results. For the MV60 and W50 teams, the tables have been filled in, but it is clearly stated that there must be 4 teams completing enough counting races. Senior Women:- Megan – 9th. WV45:- Helen – 6th : Nicola – 8th : Nicky – 10th. MU23:-– Max – 1st : Joe Law – 4th. SeniorMen:- Tom – 6th= : Rhys – 8th : Max – 10th. MV50:- John Hunt – 5th. MV60 – Dave Allen – 6th=. M65:- Keith – 6th : Stewart – 10th. MV70- DT – 5th : Ken – 6th. 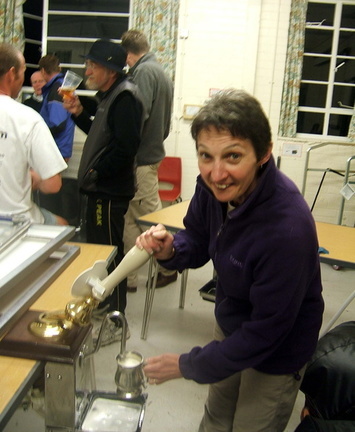 Senior Women – 3rd ( 2nd at Howgills) . WV40:- 1st ( 1st at Howgills) . WV50 – 1st – ( 1st at Howgills) . but only 3 teams involved, and 4 is required. Senior Men:- 1st= ( 2nd at Howgills) . MV40:- 2nd= ( 4th at Howgills) . MV50:- 3rd ( 3rd at Howgills) ..
MV60 – 1st – ( 1st at Howgills) .but only 2 teams involved, and 4 is required. Dungeon Ghyll:- Some total classic up Harrison Stickle. Dry, warm and sunny....Results. Monday – Trunce 1:- Results. Tuesday – Liver Hill - Results. ... saw a packed house at Tha Sportsman.... as well as some snow en route. Dave Bollington bore the weighty responsibility, of being the only identifiable Wart present, admirably. A number of routes at varying speeds were run. Some of those taking in the traditional way points of north Lees pond and Little John's grave. English Championships - after Stretton Hills. WV40:- Helen – 7th : Nicky – 9th. WV45:- Helen – 4th : Nicky – 6th. WV50:- Nicky – 2nd : Nicola – 6th : Alison – 10th. Senior Men:- Rhys – 5th : Max – 8th. MV40:- Will Boothman – 7th. MV50:- John Hunt – 6th. MV60 – Dave Allen – 7th. WV50 – 1st – and there were the necessary 4 teams…. MV60 – 3rd – but only 3 teams involved, and 4 is required. Greg calculates the Senior Men - 1st, by that one point : M40 - 4th : M50 - 4th : Women - 4th : The rest to be awaited, and the statistician will be deciding things. With it looking to be close, just essential to be getting best teams out, if possible. Bilsdale – a new, AL race, up in the N Y Moors. Stan Bradshaw Pendle Round:- Results. A very pleasant wander around Pendle paths and tracks. National Cross Country Championships – at Harewood House….Results. Tour de Llyn Llydaw - from New Year's Day....Results. Ilkley Moor:- Very dry up there today, and even warm. A pity about the inevitable bottleneck start, whether a bit of re-thinking might help, but once we get going, it’s a good, hard AS course. Results. New Chew – is cancelled. Runners and Riders – a new Wharfedale race, for Ted Mason’s 40th birthday. Bikes and runners set off together. Hopefully a return for Carshare….but not yet driving....And it was a gem of a race. Bikes and runners set off up the hillside, rolled around the top lands in the lying snow, to find a ravine, and then back down the hillside to finish. Results. Rombalds Stride – the traditional first long event up here, around Ilkley Moor…. Kong Mini MM – from Capel Curig - Results. The Spine. Lots to be following here, Jasmin has done well, , and Steven Jones has safely finished. Enormous respect to everyone out there. Hoofstones – Carshare League. News eagerly awaited, and is now on DPFR results. Results. So into a New Year, with very best wishes from Carshare, for whatever our hopes should be. Jubilee Plunge - report and results. Looks to be a mad downhill hurtle in the Clwydian Hills. Totley Two Turtle Doves - Results. Wansfell:- a simple race, start in Ambleside, round the top and get back down. Short, sharp and hard effort indeed. Although only AS, full kit was required, understandably, and so a reminder that we takes the lot to each and every race. Results. Stile End – Kong Winter Series:- Results. The Stoop - relatively benign conditions today above Haworth, not too cold and little wind. Plenty of sinking bogs around, though nowhere near as wet as sometimes it is...Results. Peak Raid – Round 4 :- Baslow. Results. Carshare has delivered Christmas presents, over in Zurich….and the e-mail is now email , please.